“What do you want, sir? Whatever you want, I can get it for you. Anything you desire.” The diminutive Thai man seemed sincere, and I believed him. After all, his offer was in perfect keeping with the rest of Khao San Road, a hallucinogenic half-mile in central Bangkok that promises indulgence, diversion, hedonistic gratification, and above all, escape. One of the great Asian meccas of the backpacker subculture, a Xanadu for dreadlocked wanderers, Khao San Road is a place where cutthroats buy, sell, and forge everything imaginable without consequence, repercussion, or second thought. To travel to this gritty, upriver section of Bangkok is to pass from one oxymoronic world into another. 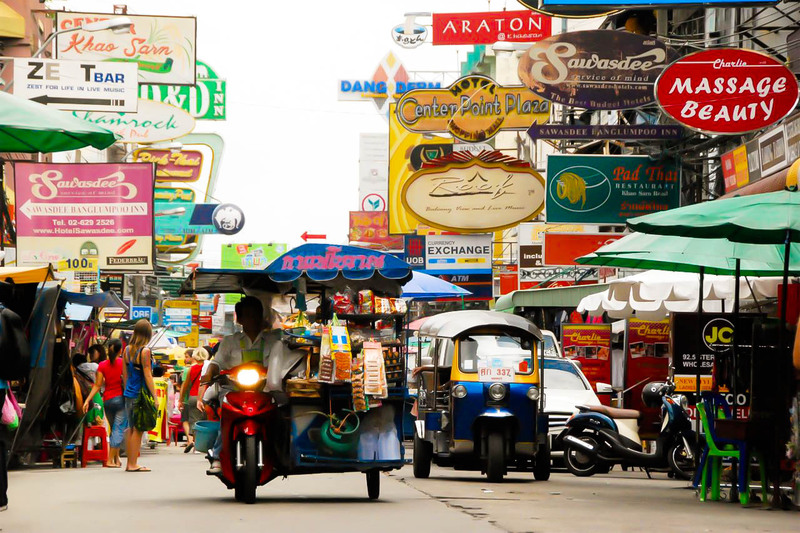 The booming Thai capital is at once traditional and commercial, conservative and carnal. Khao San Road takes Bangkok’s complexity and chucks it into a meat grinder. Apart from the occasional peal of gongs coming from the Chana Songkram Temple a few blocks away, there are few remnants of Thai culture here. Shaggy young rebels from Western nations, having abandoned their homelands, huddle together in self-congratulatory masses, blowing smoke, swilling cheap booze, discussing Kafka. What was once a quiet rice market has, in the past three decades, hawked its heart and soul for no discernible reason other than to make a quick buck. The street was choked with stalls. In the span of 50 feet, you could procure a tank top, batik bag, knock-off designer clothing, fake electronics, pirated CDs and DVDs, photocopied books, jewelry, beads, and falsified press passes and driver’s licenses. I could have gotten any part of my body pierced and followed it up with a low dollar tattoo. It was under the peeling eaves of an all-night disco called the Octopus Club that I noticed a gray-headed man with a Swedish bankcard withdrawing fistfuls of Baht from an ATM. He shuffled the money to a Thai coquette who simpered hungrily in his shadow. The man exchanged knowing glances with his inamorata and the two made a sauntering escape. I hurried by him only to be startled by a portly Thai man who leapt into my path and offered to sell me a Spiderman suit, a tattoo, and several yards of costume fabric. The spiel was so bizarre that I nearly asked the man to repeat himself. How many people could have possibly taken him up on such a proposition? I hadn’t noticed a single superhero wandering in and out of the flophouses. Continuing on past rows of massage parlors, grimy clubs, cheap restaurants, and roach-infested hostels, I watched a big-hatted woman carrying a tray of underwear kick an enormous rat against a metal wall. She was wearing flip-flops. She was unfazed. She had done this before. I was nearing the end of the street. I laughed to myself at the sight, up ahead, of a Burger King, KFC, and Subway, all side by side. The sinister capitalism that I had heard so many backpackers rail against had wormed it’s way into their private kingdom. All three restaurants were full. I turned and looked back down the road one last time. The signs, the stalls, the tailors, the parlors, the shamans, the shame. Sometimes escape is overrated. The real world is plenty, is the only world for me.